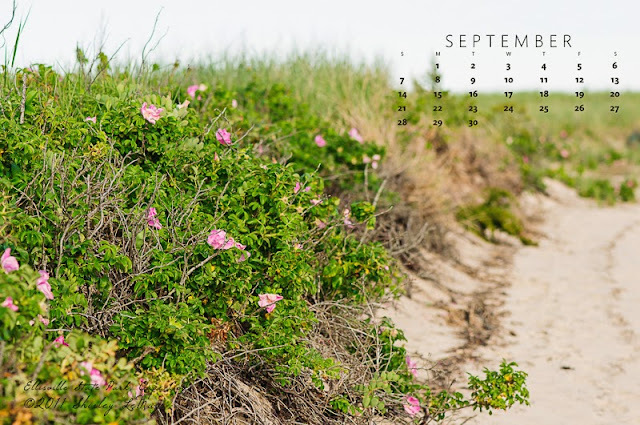 September's Desktop Calendar displays the beauty of Cape Cod's sand dunes - filled with wild sea roses. I shot this image in 2011 while visiting my parents who spend their summers in Plymouth, MA, a town considered to be the gateway to Cape Cod. When I pulled up this month's calendar image, I was surprised (I curate my calendar images in December - I never remember what's coming next) and felt a bit nostalgic. Nostalgic because my parents recently decided to sell their Plymouth home, a beautiful, light filled place that sits high upon the hills, overlooking the pines. Whenever I visit, I'm filled with calm and serenity. I'll definitely miss the place. If you care to view some of the photos I've taken over the years while visiting my parent's place, I've compiled some of the photos into an album on my flickr stream.